I had some broccoli just waiting to be used up in my fridge the other day, and knowing that I had a very busy week in front of me, I decided to make a quick and easy cream of broccoli soup for a simple go-to dinner. What’s more, this is one of those wonderful recipes where the flavor improves as it sits. In fact, I like to throw the soup together before work, and then when I get home, I have an incredibly flavored dinner waiting for me to simply reheat. Easy. Serve this soup alongside some tasty focaccia and you have a perfect meal, enjoy! What is your favorite vegetable soup? Let me know below! Paula’s Notes: I like to leave some texture to my soup, so when it is ready to be puréed, I remove about 1-2 cups of broccoli and set them aside. After puréeing the rest with my immersion blender, I then reincorporate the remaining broccoli for a smooth, yet perfectly textured cream of broccoli soup. Salt – to taste (depends on the saltiness of your stock) I used about 1/4 tsp. Add onion, celery, and carrot and sauté until tender. Add garlic for the last 30-45 seconds. Add broccoli and broth to vegetables and cover, simmering for 15-20 minutes, or until tender. 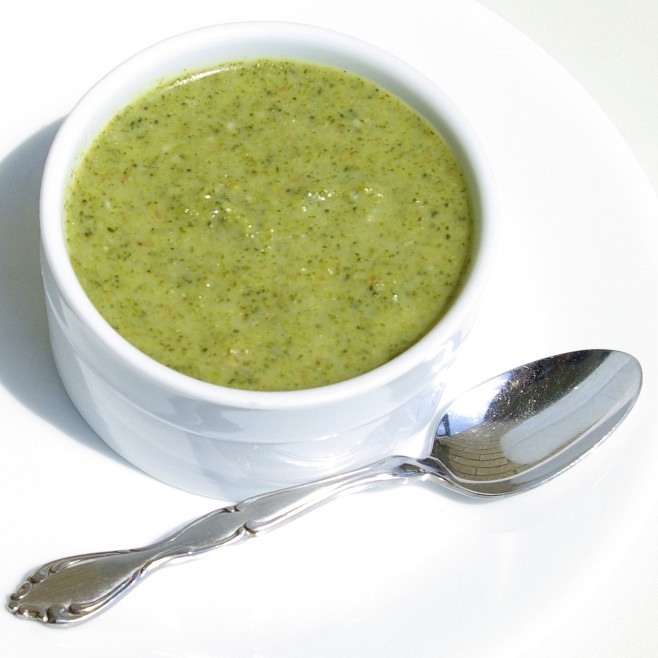 If you prefer a textured soup, remove 1-2 cups broccoli and set aside. Using an immersion blender, purée the remaining soup in the pot. Alternatively, you can purée the soup in batches in a blender, but be careful working with hot liquids under pressure; don’t overfill and hold down the lid tightly. Return soup to pot. In small saucepan over medium-heat melt 3 tablespoons butter. Stir in flour and allow to cook about 20-30 seconds to cook out the flour taste. Slowly stream in milk, whisking constantly until thick and bubbly, and add to soup. mmmmmmmm. I love cream of broccoli soup. Any thoughts of how I could make soup without a blender? I'm leaving mine in Provence and I've been trying to think of a way to make soup without it but I can't come up with anything other than getting a meat pounder out and making a mess. Excellent. I was wondering if that would work for things like butternut squash and carrot soups. I'll have to try it and let you know how it goes. I'm so going to miss my blender. Please do! I bet it would work if you let it cook long enough. I bet you will miss your blender! Could you buy a little cheap one when you move?